I believe God is in the details. He takes care to watch over every aspect of our lives so that we can have all we need to live for Him. This past weekend reveals that even more. On Saturday afternoon the youth from the church had a Progressive supper. All the details had been set out. They started at one house with hors d’oeuvres, then to the next house for the main meal, then went to White Deer for the dessert and then on to the cross at Groom. At each place, Bro. Alan Price, would share with them concerning things that took place in the life of Christ. He shared the details that led to the crucifixion and then to the resurrection. He shared how God used each event to bring about His will. The second stop was at our house where they were given the main course. But they were there longer than had been set. Let me explain. Bro. Everett was driving the people mover that had been made available to us. When they got to the first stop he noticed that one tire was low. So when he dropped the youth off at our house he went to check the air in all the tires. That is when he found it. As he was putting air in one tire he felt a rush of air on his hand and found the valve stem was no good. Douthit’s came out and got the valve stem replaced but not without delay. He wanted to make sure that the youth would be safe so he did what needed to be done and focused on the details. As I thought about this incident, the Progressive supper and it being Easter weekend, it made me stop and think. 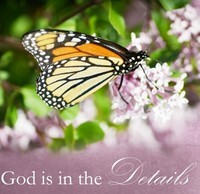 I believe that God is in the details. He uses people to bring about His will and accomplish the tasks that need to be done. You see, on the day that Jesus was taken to Calvary, Simon of Cyrene was called to carry the cross (Luke 23:26). There is no explanation as to why, but I believe it put a man where he needed to be. Each of the Gospels mention Joseph of Arimathea asking for the body of Jesus while only John brings in Nicodemus, who came to Jesus by night. (John 19:38-42). Mary Magdalene along with Mary the mother of James (and others) are mentioned as coming to the tomb on Resurrection day to anoint Jesus (Mt. 28:1; Mark 16:1: Lk. 24:10; Jn. 20:1). Mary Magdalene went to Peter and John who then went to the tomb to check things out (Jn. 20:1-10). By now, you are pretty sure that I have lost it. But let me say this. There is no doubt that God was in the details as Bro. Everett found the problem with the tire. From the crucifixion to the resurrection, God was in the details. Each of the people, who were involved in this time, did what needed to be done so that the work of Christ would continue on and hearts could be changed. God worked in the details of this time to ensure that His will be done. Our youth made it back because Bro. Everett paid attention to the details. The resurrection of Christ became known to all people because His followers followed God’s leadership. I believe God wants us to pay attention to the details in our life. What details do you need to focus on today?